The Windy Hill Resort is located in the Cayo District of Belize, close to numerous great natural attractions including monumental Mayan ruins, caves, the rainforest and many jungle rivers. Windy Hill Resort is an extensive property of nature scenery with 100 manicured acres of flowers, fruit trees, exotic plants and coconut palms. Recommended tours include the Mountain Pine Ridge, the largest and oldest reserve in Belize; Barton Creek is a Mennonite community complete with straw-hatted Mennonite farmers in horse-drawn buggies and the Xunantunich Mayan Ruins is where you can climb to the top of the main pyramid for a sweeping view of Cayo and Guatemala. 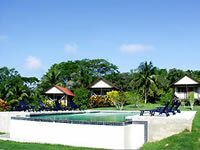 Windy Hill Resort provides an optimum of Belizean hospitality. Every cottage is decorated with exotic Belizean hardwoods, local art and hand-woven rugs. All furniture at the resort have been made by local craftsmen. This hotel serves the finest home-cocked Belizean dishes and also includes the Dory bar for after dinner drinks.